This April we are commemorating what has now been 40 years in solitary confinement for Albert Woodfox & Herman Wallace. 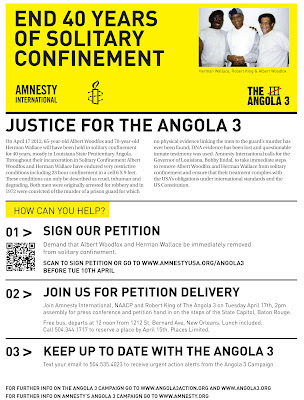 On April 17, Robert King will be joined by Amnesty International and other supporters at the Louisiana State Capitol in Baton Rouge to present Amnesty International's petition to Governor Bobby Jindal demanding that Wallace and Woodfox be immediately released from solitary confinement ( view/download the flyer here). A press conference on the front steps of the State Capitol will begin at 2pm. A free bus will be departing New Orleans at 12 noon, from 1212 St. Bernard Ave. Seating is limited, so please call (504) 344-1717 to reserve a place by April 15. If you have not yet done it, this is your last chance to sign the petition before delivery to Governor Jindal. and sent it to all your friends. We need as many signatures as possible. The deadline to sign it is Tuesday April 10. This Friday, April 6, we are organizing an event in support of the California hunger strikers and marking the 40 year anniversary, with an appearance by Robert King at UC Hastings College of the Law in San Francisco, co-hosted by the Hastings Race and Poverty Law Journal and the Hastings chapter of the National Lawyers Guild. If you are in the area please come and join us. Read more here. 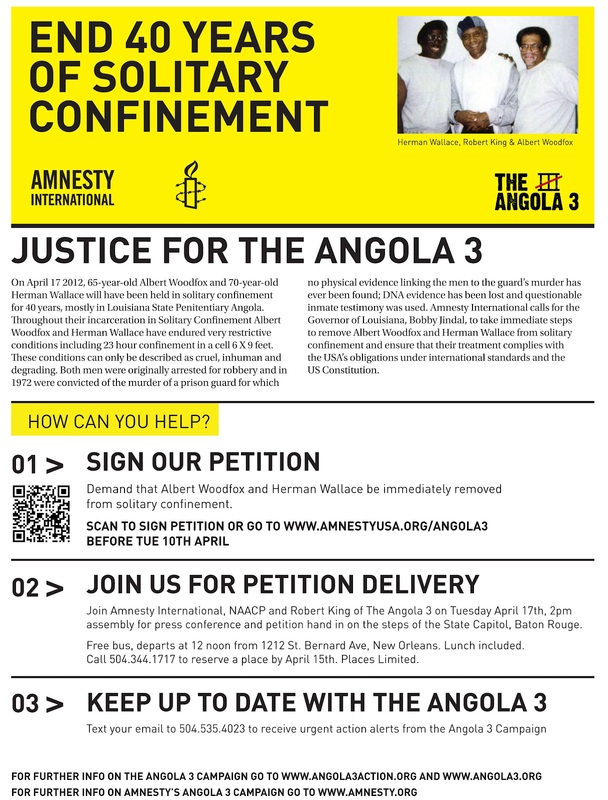 Today, BBC News Magazine released an excellent article about the Angola 3, entitled "Forty Years in Solitary Confinement and Counting," to be aired on Thursday, April 5 at 11:00 BST and Monday, April 9 at 20:30 BST. See also the new Public Radio International article, here. We've got the wind at our back and need to take full advantage of it. We send our gratitude to Amnesty International, USA, UK and all other European Chapters for their remarkable support and strong campaign effort. Let's do what we can to free all political prisoners and stop the brutal torture of our brothers and sisters in struggle-expand your network and stay in the streets- carpe diem! Below is the full text of an email action alert sent out yesterday by Amnesty International to its mailing list. Two Black men, confined to isolation in tiny cells for the last 40 years. End the "Angola 3" nightmare. 23 hours a day isolated in a small cell, four steps long, three steps across. Three times a week for exercise in an outdoor cage, weather permitting. A few hours every week to shower or simply walk. Rare, fleeting human contact with prison guards, let alone with family. This describes four decades of existence for Albert Woodfox and Herman Wallace in Louisiana, two members of the so-called "Angola 3" who pass their remaining hours "in the hole" to this day. April 17 will mark 40 years -- 14,600 days -- of their nightmare. The conditions in which these two men are held, as well as the tragically absurd duration of this punishment, violate a host of human rights treaties to which the US is a party, including those covering basic standards for treatment of prisoners. Prisons simply shouldn't operate this way in the US. 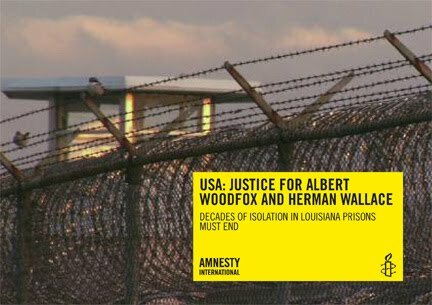 Demand an end to the cruel and unnecessary solitary confinement for Albert Woodfox and Herman Wallace. Our goal is to collect 14,600 petition signatures from just this email alone -- one signature for every day each man has spent in isolation. Janina , can we count on your voice? Woodfox and Wallace may be in isolation, but they are not forgotten. Our calls for justice will ring loud -- on April 17 we'll make sure Louisiana Governor Bobby Jindal hears us when we arrive at his Baton Rouge doorstep with tens of thousands of petition signatures in hand. We can't let more days pass without justice. Herman Wallace is now 70 years old, Albert Woodfox is in his mid-60s, and both men are suffering from serious health problems -- made worse by the appalling deprivation in which they live. Ill, advancing in age, with clean disciplinary records for the last 20 years -- what is so dangerous about these men that could possibly warrant this inhumane treatment, for so long? Because the prison authorities see them as a threat. The "Angola 3" organized their fellow prisoners against inhumane treatment and racial segregation in the early 1970s. Angola Prison's warden, Burl Cain, has suggested that Woodfox and Wallace's continued isolation is based on their political activism -- particularly their association with the Black Panthers. The "Angola 3" case highlights the failings of a Louisiana justice system that is undermined by discrimination. No physical evidence links Woodfox and Wallace to the 1972 murder of a prison guard. Inmate testimony is questionable. And judges who twice overturned Woodfox's conviction for the murder cited racial discrimination, prosecutorial misconduct, and more. 14,600 days in solitary is far too many. But today, we can do something about it -- demand justice for the remaining "Angola 3". And on April 17, we won't take no for an answer in Baton Rouge!